The first records of a harbour, or haven, show it about a mile inland from where it is now. It was situated on the River Brit close to Bridport town itself. There was an ongoing struggle to keep it open as the river estuary repeatedly silted up. To overcome this in the late 14th century a quay was built at the old river mouth, beside the East Cliff. The area was named Bridport Harbour. It is here, in 1403, Joan of Navarre arrived by boat on her way to marry Henry IV. The harbour prospered for fifty years until winter storms damaged it. In the mid-15th century a new harbour was constructed and it prospered once more. 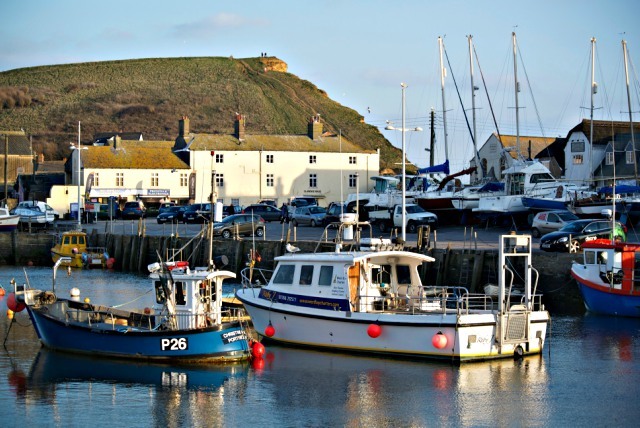 Bridport had been an important centre for the production of rope, twine, netting and sailcloth since the 13th century. The 18th century opened up global trading and the market for Bridport’s rope grew rapidly. The harbour was ill-equipped to meet the demand, being too small for larger ships and having ongoing issues with silting up and storm damage too. To try to solve these problems a new harbour was built. Work started on it in 1740 and within four years it was open. With a longer pier entrance, the harbour was moved 270 meters to the west of the old one and the River Brit was diverted to its present position. The cost was £3,500, which is equivalent to roughly £650,000 in today’s money. The harbour, capable of holding up to forty 100 tons sailing ships, fuelled the resurgence of Bridport’s rope making industry. A few years later a second pier was added. In the 1820s extensive repairs and improvements to the harbour strengthened and deepened it to take larger ships. At the time the new harbour was built it was separated from the town by a flood plain. There were no roads running over the plain, only hundreds of rough tracks. The only buildings near the harbour were a few grouped around the Bridport Arms. 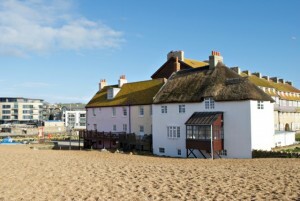 The cottages on the edge of East Beach were built a few years after the harbour opened. These include the Pink House which used to be owned by the film director Stanley Kubrick. On a quirkier note, records mention that in 1757 a mermaid measuring thirteen feet long was washed up on shore further along the beach, east towards Portland. It’s surmised now that it might have been a manatee or sea-cow washed in from somewhere far southwest. 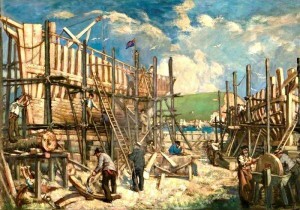 SHIPBUILDING – A shipyard opened on a sloping site to the west of the new harbour to build large sailing ships. It expanded over the years to become one of the most successful in Dorset. The earliest record of a ship built there, the North Star, is in 1779. A full-rigged ship named Speedy, the largest one ever to be built at the shipyard with a weight of over 1,000 tons, was launched in 1853. In its heyday the yard employed 300 men. At one time there were thirteen houses and a ropewalk within it, as well as several slipways and construction sheds. In 1879 the last ship launched, a century after the first and roughly 400 ships later. It was the end of wooden shipbuilding of any size. No remnants of the old shipyard can be seen these days. PORT WORK – Rope and nets were delivered by horse and cart from Bridport and stored in warehouses before being shipped out. It wasn’t only rope products which were sent along the coast or abroad. By the 1850s thousands of tubs of Dorset butter and hundreds of tons of cheese were annually shipped from the harbour for the London market. Vessels were continually being freighted in the harbour with coal, grain and other products. Their cargoes were then shipped out to supply numerous towns near and far along the coast and inland. Use of the harbour for imports date back to the 1740s when hemp and flax were brought from Russia and timber from Scandinavia. By the 1850s wines arrived from Portugal, brandies from France and spirits from various parts of the United Kingdom and abroad. 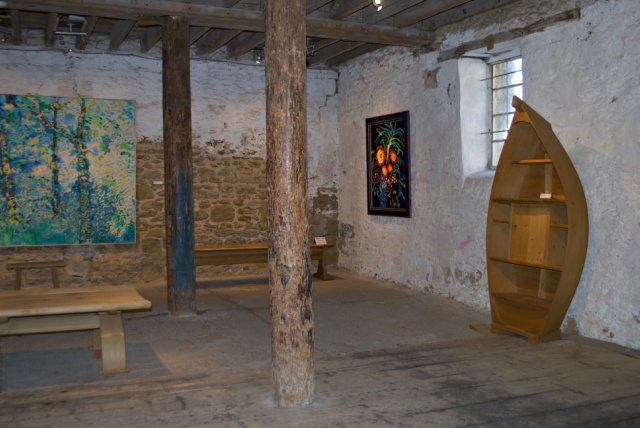 Today West Bay’s history is revealed in the massive stone warehouses near the harbour. Sladers Yard, now an art gallery and café, is one of the few relatively unaltered Georgian ones. It still has its pulley wheel in the attic and a list of nets is written on one of the walls. GLOBAL TRADING – From the late 17th century a fleet of ships would sail from the harbour in the Spring, heading to Canada. They were laden with Bridport nets, line, ropes and salt to trade with the fishermen of the Newfoundland fishing fleet. 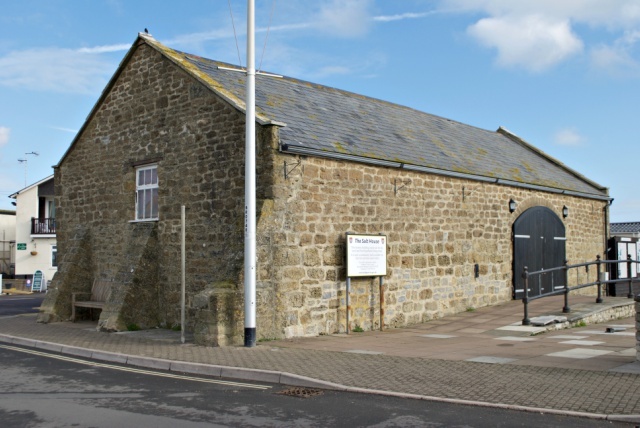 The salt was stored in The Salt House on Fisherman’s Green (see the present-day photo, it’s now a community centre). The empty holds of the ships would then be filled with dried, salted cod for the second leg of the journey. This would be either southwards to the Caribbean where it was exchanged for rum and sugar, or back across the Atlantic to Mediterranean countries to be swapped for oil, fruit, wine and preserves. On the final leg of the journey they sailed back home to Dorset. This salt-cod trade triangle expanded with the development of the proper harbour and carried on well into the 19th century. FISHING – The new harbour was primarily built for exporting rope products and ship building but fishing was another important port activity. The Salt House stored salt for the local fishing trade as well as the Newfoundland one. 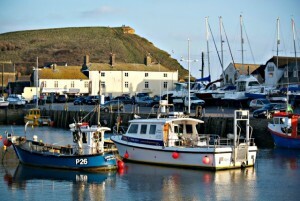 These days you often see the harbour referred to as a working fishing harbour, and West Bay called a fishing village. Fishing boats still land their catches on the harbourside for transport to market. Recreational sea anglers can charter boats to take them out into Lyme Bay and they can fish off the piers too. 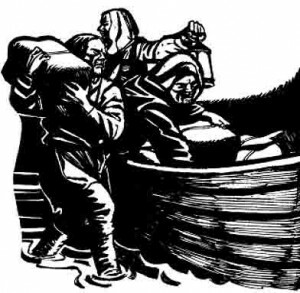 SMUGGLING – “Free-trading” was prevalent the length of the Dorset coast during the 18th and 19th century. Chesil Beach was a hot spot for smugglers. They landed in darkness but were able to judge their position owing to the size of the shingle pebbles graded by the sea. 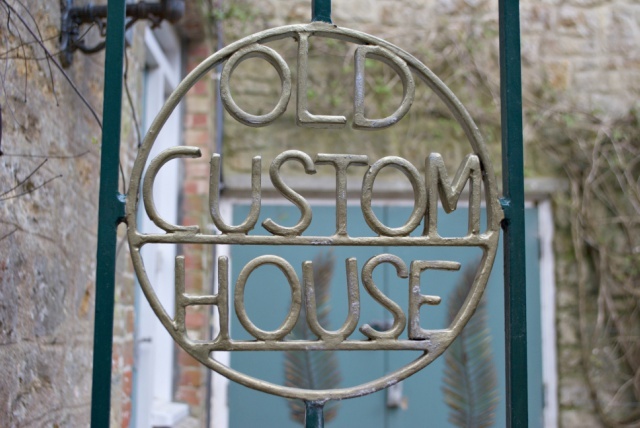 In one incident in the early 18th Century a large group of locals illegally carried off a large cargo of spirits and salt at Bridport Harbour whilst Customs officers looked on helplessly. For a considerable time a gang of smugglers under the leadership of the ‘Colonel’ of Bridport operated locally. Legend has it that the gang was so successful they took orders from pubs in advance. Once a landing came unstuck and the cargo had to be sunk to avoid discovery. This floated ashore all along the coastline including at Bridport Harbour, much to the joy of the locals. Probably the last major smuggling run in the area occurred around 1882 when it took almost six months and five attempts to land tubs of French brandy. For one attempt the chosen spot was the sluices of Bridport Harbour. 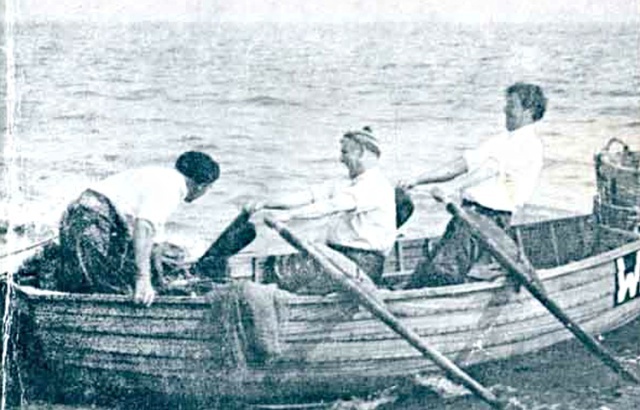 A few tubs were put ashore before the officers intervened. Once more the smuggler’s boat put to sea. Eventually they made their way to Abbotsbury where, at last, the final part of the cargo was landed. PREACHING – Open-air preaching on the quayside and aboard boats anchored in the harbour started in 1817. One of the two Methodist preachers was called Dr Giles Roberts. He was born at the Ship Inn in 1766 and invented an ointment known as the “Poor Man’s Friend”. This was said to cure aches and pains. The ingredients included, rather worryingly, lead and mercury. In 1849 the Methodist Church on East Beach, known as “The Chapel on the Beach”, opened. It closed in 2007 due to a dwindling congregation. 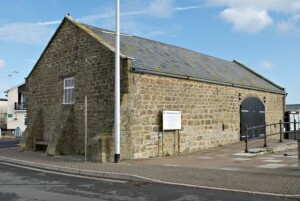 It has recently been converted into West Bay Discovery Centre. 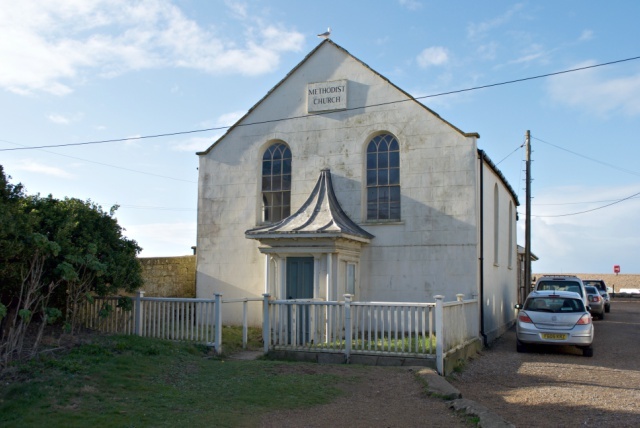 Incidentally West Bay’s other church, the 1930s Arts and Crafts St John’s Church, is still in use today. DRINKING – The Bridport Arms was built around 1700, making it the oldest surviving building in the area. It was originally called The Ship, also know as The Sloop, and it is thought to have been a cider house and farm. 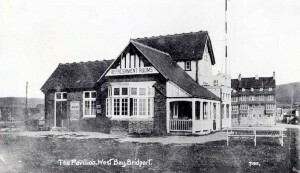 It was renamed the Bridport Arms in 1822. The building underwent complete restoration in 2005. The Neptune Inn, behind East Beach, was built in 1739. 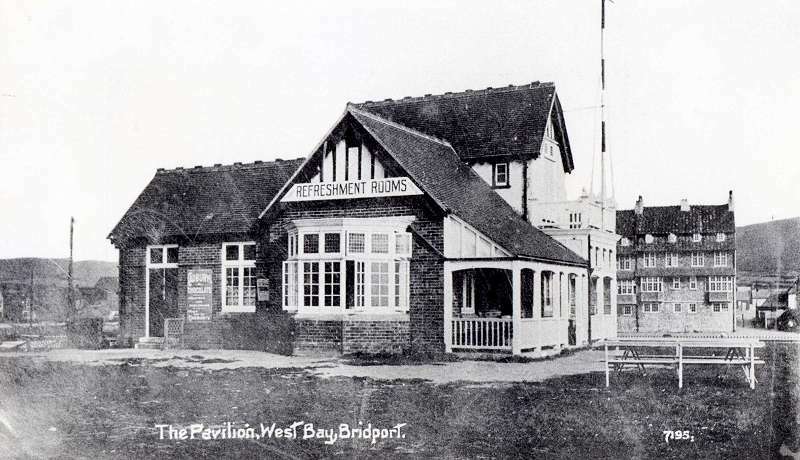 It was renamed the West Bay Hotel in 1884 when the new railway station was named Bridport West Bay. These two were later joined by a third pub, the George Inn, built around 1820. It burnt down in 1834 and was rebuilt in 1839. The three pubs are still going strong to this day. In the early to mid-19th century, with the export of Bridport’s rope products thriving and the shipyard flourishing, the harbour area entered its main period of development. The addition of new streets, houses and warehouses created a relatively self-contained community with housing for workers, supervisors and merchants. 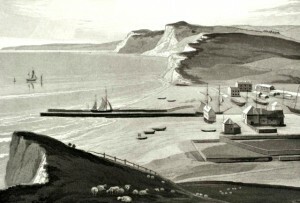 A new direct route between Bridport and the harbour, Harbour Road (now West Bay Road), was laid down in 1819. At about the same time George Street was laid out to the north of the harbour, along with three warehouses, the pub and a couple of rows of terraced houses on the south side of the street. More warehouses were added shortly afterwards on and near George Street. These included the Old Timber Yard warehouse (now used as artist’s studios, you can see it out of the front bedroom window in the cottage), along with another terrace of houses built at right angles north of George Street, called Swains Row (yey!). In November 1824 there was a great storm. Boats in the harbour were washed up onto the quay. There was considerable damage to the piers and harbour, as well as the death of one family and 29 sheep. The waves flooded the harbour and seawater covered the floodplain of the River Brit quite a long way towards Bridport. By 1830 over 500 vessels were using the harbour each year. In 1832 Bridport Harbour became a full bond port, collecting customs payments. This required a Customs House, which opened at Clarence House (the big white building in the photo), and secure warehousing. 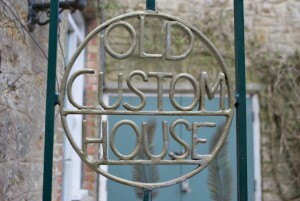 One of the old customs bonded stores is now part of the Customs House Vintage Emporium. In 1838 William Swain, a local landowner and merchant, built a large detached villa, now the Haddon House Hotel. In the second half of the 19th century the prosperity of the harbour started to wane. Bridport’s rope and nets were in less demand. Sailing ships were being replaced by steam-powered ones for which the harbour was entirely unsuited. 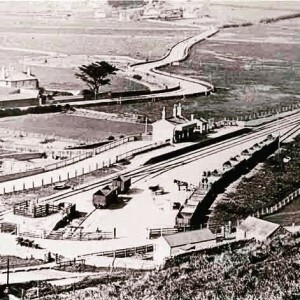 In 1857 the railway arrived at Bridport. The railway competition started to bite into the harbour trade too. The use of the harbour went into decline and, in 1881, it lost its bond port status. That year the customs payments collected were only 10% of those taken 50 years earlier. By the late 19th century there was no more ship building and harbour trade had dwindled. In 1884 the Great Western Railway was extended from Bridport to the harbour. 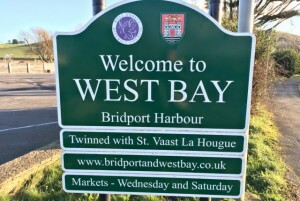 The new station was initially called Bridport Harbour, but it was soon renamed Bridport West Bay by the GWR to attract day trippers and holidaymakers to the seaside by rail. Some older 19th century maps referred to the stretch of sea in the area as West Bay so this must have influenced the new name, although it was neither west of Bridport nor a bay! Soon the whole settlement was known as West Bay although, even today, it is also known as Bridport Harbour. Most of the land in the area was owned by two people, the archaeologist Augustus Pitt-Rivers and the 5th Earl of Ilchester. In 1884 they, together with other local entrepreneurs, created a company to transform West Bay into a seaside resort, a holiday destination. A prominent Arts and Crafts architect called Edward Schroeder Prior produced extensive designs and plans of villas and lodging houses for the anticipated influx of visitors. Only three of the buildings came to fruition. First was Pier Terrace next to the harbour’s east pier in 1886. A startlingly large building, the locals called it Noah’s Ark. 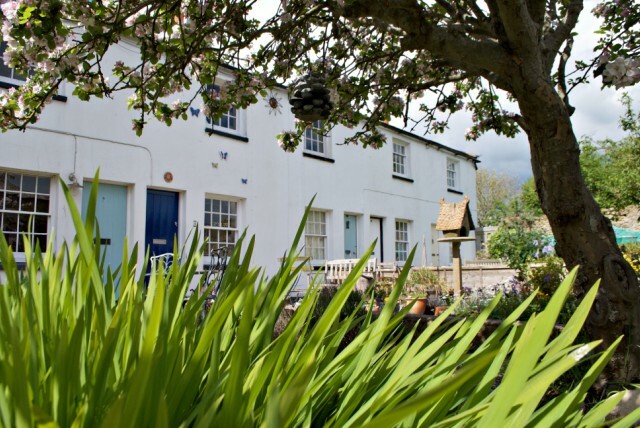 It was built as ten lodging houses to provide sixty bedrooms for the gentry escaping to the Dorset sea air. The two houses at the southern end were set alight in 1929, when the arsonist responsible was seen “dancing on the doorstep with a blazing torch!” They were rebuilt as flats with four storey bays. An extension was added to the north in the 1970s (Harbour Café). The Moorings on Harbour Green and Querida, just west of Harbour Bridge, followed later in 1905 and 1906. In 1887 an Esplanade was built along the west beach’s seafront together with The Mound by the west pier. In 1901 a Pavilion was built on The Mound (see photo) but it washed away in 1942. A sailing club and a swimming and water polo club, for men only, were started. The early morning train to West Bay became known as the “Bathing Train”. There were three bathing machines on West Beach. A golf course was built on West Cliff and then moved to its East Cliff home in 1911 with eighteen holes. Actually it was only ten holes for a while, with eight of them being played twice! The terrace of coastguard’s cottages were built in 1905 near East Cliff. Nick Berry’s harbour master character lived in one of them in the TV series Harbour Lights. In 1912 the Custom House moved from Clarence House to a building next to the Arcade “cut”. This is the walkway linking George Street to Harbour Green. The eagle-eyed might notice this gate there. Clarence House was turned into a hotel. In 1914 a 15-acre plot of land on West Cliff was sold, the West Cliff Estate was formed and bungalows started to be built on the land. By the 50s the private estate was nicknamed “Nobs Hill”! Wooden chalets were built along the seafront behind West Beach. 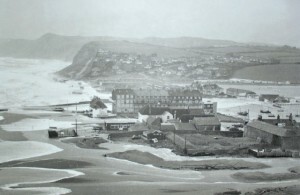 West Bay’s “Bungalow Town” (see photo below) was demolished in the 1960s. On 22nd September 1930 the passenger train service between Bridport and West Bay ran for the last time. The line was kept open for goods trains until 1962. In the 90s the station was restored and has since become a café, and now the Station Kitchen restaurant. In 1935 the Riverside (now Rise Café Bar) opened in a wooden hut next to the river, on the peninsula of land next to George Street. A café at the time, it often flooded during the 60s and 70s and was rebuilt in 1976. For a while there was a post office in a hut next to the café (see it in this photo below from the 1960s). During the Second World War a large Nissen hut was constructed on land between the railway station and West Bay Road to house troops. The Army billeted the West Cliff Estate, with houses on the cliff being used by officers and their families. Artillery was installed on the estate to protect West Bay from possible invasion. The owners were allowed back into their homes after the end of the war. George VI visited West Bay as well as many important military officers, including Field Marshal Montgomery. The film star Douglas Fairbanks Jr. (a US Navy officer, see photo) came ashore at West Bay. In 1940 the occupants of a German Bomber were captured after it crash-landed on a beach at West Bay after running out of fuel. In 1942, because Pier Terrace had an appearance reminiscent of some northern French ports, West Bay was used as a training ground for the Dieppe Raid (Exercise Yukon). Most of West Bay was evacuated but accidentally the people who lived in the railway station, including the station master, were not. They woke up to find French Canadian troops outside, speaking in a foreign language. They were quite alarmed because they thought it was an invasion force. The Canadians weren’t expecting to find anybody in West Bay but ended up having a cup of tea in the station. The actual raid was disastrous, with an exceptionally high number of men killed, wounded or taken prisoner. In 2017 a number of events took place in West Bay to mark the 75th anniversary. 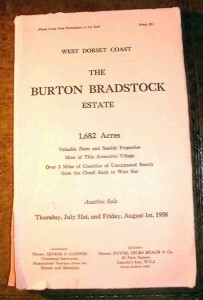 In a huge auction in 1958 Captain George Lane Pitt-Rivers sold “The Burton Bradstock Estate”. 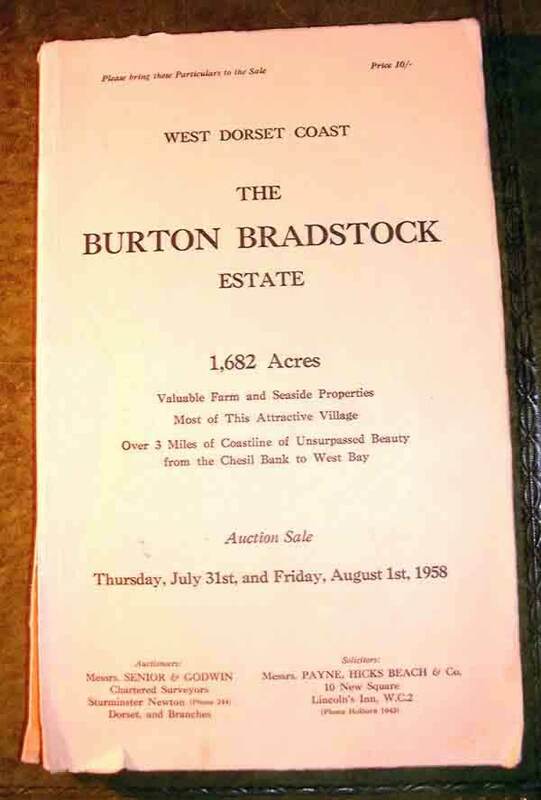 The catalogue cover for the auction describes the sale of “Valuable Farm and Seaside Properties. Most of This Attractive Village. Over 3 Miles of Coastline of Unsurpassed Beauty from the Chesil Bank to West Bay.” This included East Cliff, Haddon House, Swains Row, West Dorset Golf Club, Freshwater and a large area of Burton Bradstock totalling 1,682 acres. The auction, held over two days, made over £175,000. This is equivalent to about £3.8 million today. It’s an indication of how rising property prices have outstripped inflation since then. The 1960s and 1970s decades saw the appearance of some new buildings. These catered for increasing numbers of people visiting and many more cars too. Old stone sheds and yards left over from the days of the port make way for new builds, sadly (aesthetically anyway) with the typical “looks” of their era. These included Harbour House and Chesil House in the harbour area. Also the holiday flats built behind West Beach on some of the old shipyard land. A new Promenade was constructed along West Cliff and the side of the cliff reshaped to reduce land slips. 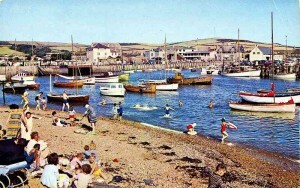 The caravan and camping site was developed too (now West Bay Holiday Park). 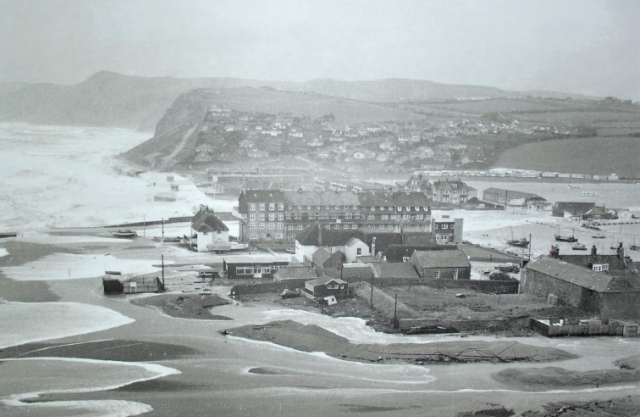 Until the 70s there was a small beach actually in the harbour (see photo), as well as East and West Beach. In 1972 the thatched roofed Old Watch House on East Beach, originally the Coastguard lookout, was destroyed by fire. 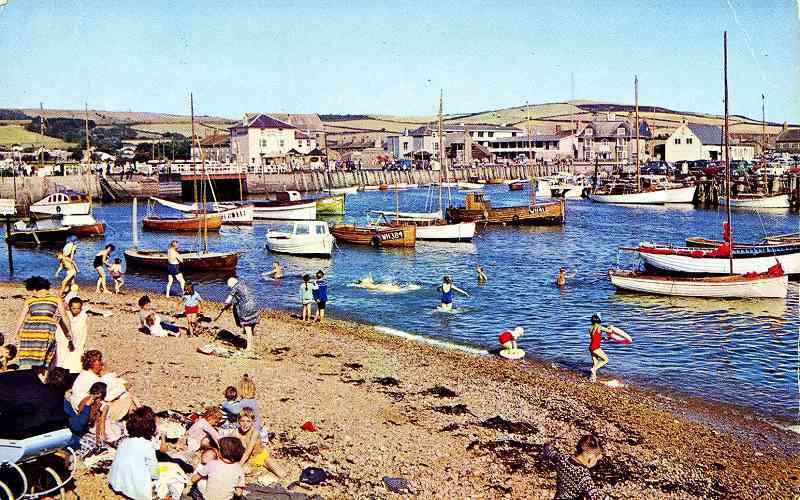 In 1972 Bridport Harbour, the historic core of West Bay, was designated as a Conservation Area. It contains approximately thirty Listings, including Swains Row. 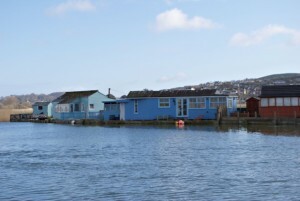 Flooding regularly took place in West Bay, particularly in 1974 and 1979 when the sea severely breached East Beach. In 2001 the Jurassic Coast was designated as England’s first natural World Heritage Site because of the special importance of its rocks and fossils. It spans almost 100 miles between East Devon and Studland Bay in Dorset with West Bay at the heart of it. West Bay soon became known as the “Golden Gateway to the Jurassic Coast” because of the golden sandstone of East Cliff. Formed from Lower Jurassic Bridport Sands, it exposes 180 million years of history. All through its history the harbour has had to cope with no shelter against south westerly winds and the high tides. By the beginning of the 21st century changing wind and sea currents had made its entrance unnavigable for almost half the year. 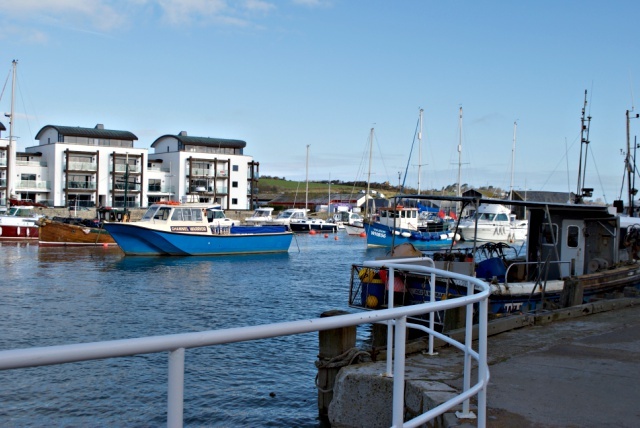 A decision was made to extensively redevelop the harbour’s 1740 narrow canal-like entrance. As part of a new coastal defence scheme the west pier was replaced, the east pier rebuilt and a new outer harbour with a wide slipway developed. This work, completed in 2005, transformed the entrance to West Bay. See the “before and after” photos below. The new West Pier was named the Jurassic Pier. The harbour is now a safe berth on an otherwise exposed length of the beautiful Jurassic Coast. Extensive rock armouring was used to protect West Bay from serious damage and flooding in the future (fingers crossed). In 2014 West Bay was battered by ferocious hurricane force gales in excess of 80 mph, coinciding with spring tides. Conditions were the worst in living memory but there was no serious damage or flooding. 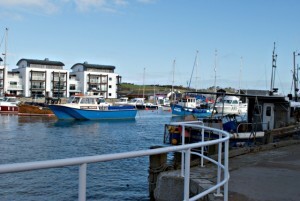 An improved harbour offered new opportunities, bringing about a spate of building in recent years. The old village garage, Harbour Garage, was demolished in 2005 and replaced by the flats and shops of Maritime House (the building which includes West Bay Tea Rooms). A small row of large terraced houses, Beachcombers, was built on East Cliff on the site of the old Golf Club House. Driftwood Apartments, along Forty Foot Way, were built in 2006. In 2007 Quay West, a development of 45 swanky apartments plus a shop and café, was built on part of the old shipyard land overlooking the harbour. These buildings had a major impart on the appearance of the harbour, dividing local opinion. It’s unlikely there will be any more building around the harbour in the near future. Plans to build on the Mound and the George Street boat park were shelved when the Government changed their policy on development within areas of flood risk. 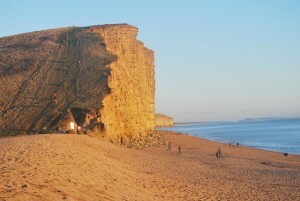 In 2012 the harbour, cliffs and beach were used as locations in the acclaimed ITV series Broadchurch. West Bay experienced a noticible increase in visitor numbers following its airing in 2013. A second series followed in 2015 where DI Alec Hardy, played by David Tennant, lived in the little blue hut, just up river from The Riverside. The third and final series returned early 2017. 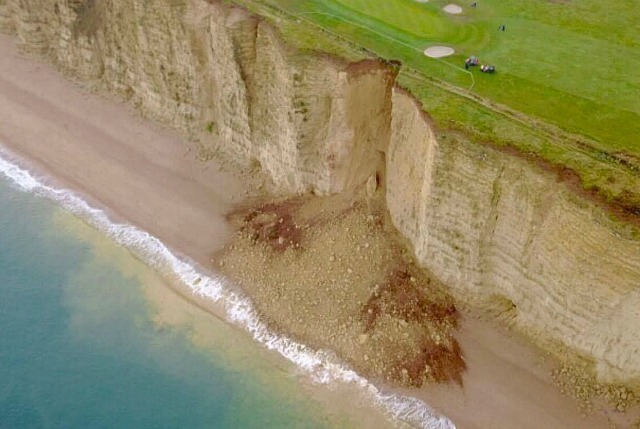 In June 2017 a major rock fall occurred at East Cliff, cutting the cliff-top footpath and just extending back into the golf course. 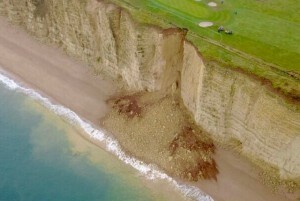 An estimated 2,000 tonnes of rock collapsed, blocking the beach beneath. Well that’s it, phew! Up to date until whatever happens next in West Bay worth a mention. 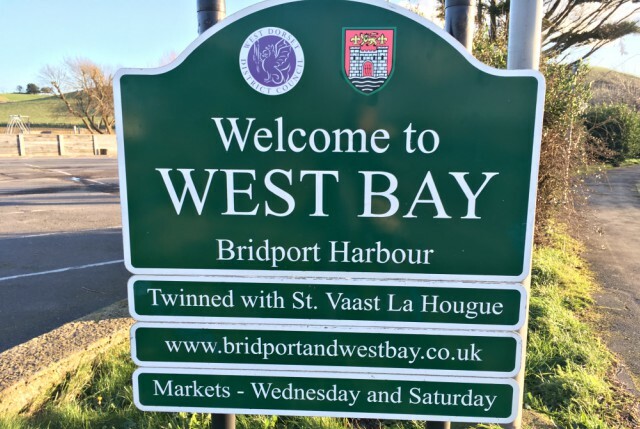 If you’ve read all this and want to see West Bay for yourself but haven’t yet booked accommodation, then we’d love to welcome you to West Bay Cottage. Take a look inside the cottage here if you wish. Head to our Book With Us page for availability, the rates and how to book. Or please keep on reading for some history of the cottage. Note: Thanks to the author of the westbay.co.uk website. Much of the information was gathered from it, as well as a couple of the vintage photos. 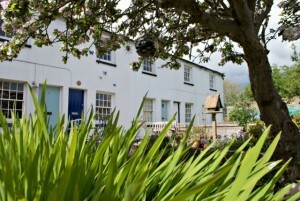 So what have we found out about our favourite West Bay cottage? As mentioned above, Swains Row was built back in the 1820s. 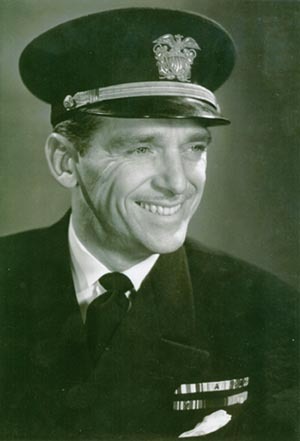 The origin of “Swain” is from William Swain, local landowner (including Haddon House) and merchant, nothing to do with the more romantic boatswains or lovers. There is no mention of the row being built for fishermen. It seems more likely they were built as shipwright’s cottages or for port and warehouse workers. There used to be a Swain’s Yard (where the Angling Centre is now) so perhaps William Swain built the row of cottages for his workers. Our floorboards are made from tree trunks shipped back from America in the eighteenth-century. Ships set sail laden with rope and nets to trade. For the return journey large American logs were used as ballast in the ships’ holds in order to remain upright and stable at sea. Upon arrival in England, those same timber cargoes were made into, amongst other things, our floorboards. In the 1958 village auction the cottage was sold for the sum of £350. Number 1 sold for £300 and the remaining five cottages were sold as one lot for £1,800. Incidentally Haddon House went for £4,000. We don’t know what date the bathrooms were added to the cottages. 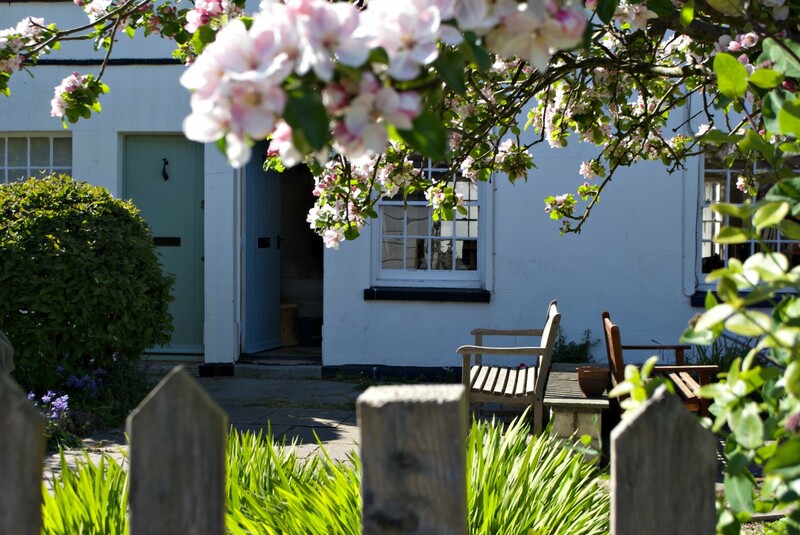 However the 1958 auction catalogue mentions that the cottage had been renovated with the help of an Improvement Grant (£144 3s 3d) in 1955 so we’d guess it was for this purpose. The details for the remainder of the cottages (3 – 7) also notes that these cottages were recently modernised under the same scheme. In 1971 the three garages in front of numbers 1,2,3 Swains Row were built. Swains Row was given Grade II listing in 1975. Swains Row flooded badly in the 1970s. Apparently the water height once reached several feet up the walls. In 1987 the couple who owned number 2 bought number 3 too. They joined them together to form one three-bedroomed dwelling. From the outside it still looked like two separate houses. Inside the kitchen was removed from number 2, new doorways were put in between two houses and next-door’s staircase was removed. In 2005 the house was sold and planning permission was granted to turn it back into two cottages. Hence the interiors of the two cottages now look similar.